The sub-millimetre wavelength region has been identified as very useful for measurements of cloud ice mass. The only satellite sensors operating in this wavelength region are so far limb sounders, and results from two such instruments are presented and sample applications are demonstrated. The results have high intrinsic value, but serve also as a practical preparation for planned dedicated sub-millimetre cloud missions. Limited by coarse resolutions, global chemical transport models cannot well capture small-scale nonlinear processes. To alleviate the problem, we develop a two-way coupled system to integrate the global GEOS-Chem model and its three high-resolution nested models covering Asia, Europe and North America. Confirmed by comparisons with observations, the coupled system improves upon the global model with a 10% increase in global tropospheric CO, a 4% decrease in OH and a 4% increase in MCF lifetime. Lightning is important in atmospheric chemistry models as a source of nitrogen oxides which affect the greenhouse gases ozone and methane. We present a new approach to modelling lightning using the upward movement of ice in clouds, an essential part of the charging mechanism in thunderstorms. The new approach performs well compared to those already in use and provides a novel, physically based scheme that has the potential to improve the robustness of simulated flash rates and emissions. 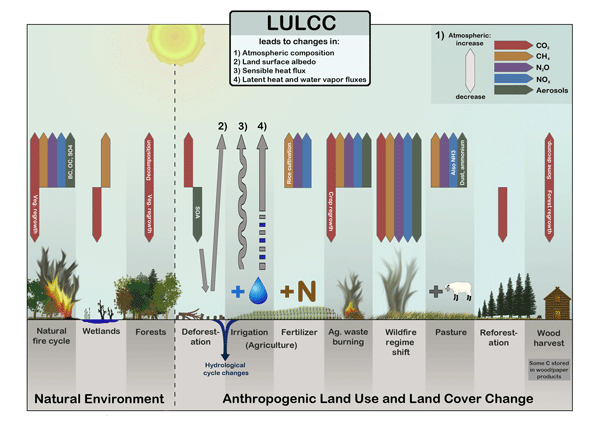 While climate change mitigation policy often focuses on the energy sector, we find that 40% of the historical human-caused change in the Earth’s radiative balance can be attributed to land use activities, such as deforestation and agriculture. Since pressure on land resources is expected to increase, we compute a theoretical upper bound on the radiative balance impacts from future land use which suggests that both energy policy and land policy are necessary to minimize future climate change. The Asian summer monsoon transports pollutants from local emission sources to the upper troposphere and lower stratosphere (UTLS). The increasing trend of these pollutants may have climatic impact. This study addresses the impact of convectively lifted Indian and Chinese emissions on the ULTS. Sensitivity experiments with emission changes in particular regions show that Chinese emissions have a greater impact on the concentrations of NOY species than Indian emissions. Radon detectors at Bern and Jungfraujoch were used to monitor the transport of radon-rich boundary layer air from the Swiss Plateau to the Alpine ridge. Radon was successfully used to discriminate between different types of vertical transport, using the shape of the diurnal cycle to identify days with upslope mountain winds. For many air-mass properties, however, the total land-surface influence (indicated by the radon concentration) was more decisive than the type of vertical transport. This study compares observations and simulation results of ozone in the lower tropical stratosphere. It shows that ozone in this region decreased from 1985 up to about 2002, which is consistent with an increase in tropical upwelling predicted by climate models. However, the decrease effectively stops after 2002, indicating that significant changes in tropical upwelling have occurred. The most important factor appears to be that the vertical ascent in the tropics is no longer accelerating. Aqueous phase occurs in the atmosphere as cloud droplets and aqueous aerosol. The Henry's law constant regulates the water-gas partitioning of a molecule, but experimental data on polyols are limited. New values are derived for molecules with 2-6 hydroxyl groups, by combining other thermophysical data (e.g. vapour pressure, water activity, solubility). It is analysed which molecules will stay mostly in the gas phase, and which will preferably partition to droplet or aqueous aerosol. An EC system was assembled with a sonic anemometer and a new fast-response N2O analyzer and applied in a cornfield during a growing season. This N2O EC system provided reliable N2O flux measurements. The average flux was about 63% higher during the daytime than during the nighttime. Seasonal fluxes were highly dependent on soil moisture rather than soil temperature. We present the first study of CO2, VOCs and NOx measured all together in a road tunnel around the Paris megacity with the aim to quantify the ratios of these species co-emitted within traffic emissions. It allows us to independently assess some of the ratios provided in the latest Paris emission inventory. It also reveals a large variability of the ratios to CO2, implying that traffic does not have a unique imprint in the urban plume, but rather leaves various signatures. Satellite measurements of CO2 and CH4 can be subject to regional systematic errors that can consequently compromise their ability to infer robust flux estimates of these two gases. We develop a method to use retrieved ratios of CH4 and CO2 that are less affected by systematic error. We show that additional in situ data are needed to anchor these observed ratios so they can simultaneously infer fluxes of CO2 and CH4. We argue the ratio data will provide a more faithful description of true fluxes. Our simulations suggest that CO2 measurements by the planned ASCENDS satellite could improve estimates of emissions and uptake by up to 50% at the weekly 1° by 1° scale, 40-75% at the annual biome scale, and 65-85% for the whole of North America. The results depend on the laser wavelength used and the assumed precision of the measurements. The resulting biome flux uncertainties, 0.01-0.06 billion tons of C per year, would satisfy one definition of mission success. The major emission sources of the reactive oxygen species (ROS) associated with ambient particulate matter in the southeastern United States were identified. The study shows biomass burning and secondary aerosol formation as the major sources contributing to the ROS-generating capability of ambient particles. The ubiquitous nature of these two sources suggests widespread population exposures to the toxic aerosol components. We investigated how an important naturally emitted chemical, isoprene, can contribute to the formation of aerosol particles, which are a key component of air pollution that can also influence climate. Specifically, we found that a particular relative of isoprene, methacrylic acid epoxide, is capable of transforming into a number of different chemical components via reaction on existing aerosol particles. These results will help to make isoprene air quality model predictions more accurate. The properties of cirrus clouds depend on the rate at which air cools as the cloud forms. Small-scale motions in the atmosphere have high rates of cooling. This usually leads to very small ice crystals. However, a few random cooling fluctuations will produce only a few ice crystals. This paper shows that these events are important even if they are rare: they lead to particles that sediment and influence a lot of air. The results show dehydration is less sensitive to details of ice nucleation. We developed an improved model for the emission of dust particulates ("aerosols") emitted by wind erosion from the world's deserts. The implementation of our improved dust emission model into a climate model improves its agreement against measurements. We furthermore find that dust emissions are substantially more sensitive to the soil state than most current climate models account for. We report a study of changes in the European air quality due to emission reductions, using the chemical transport model CAMx. The model simulations were performed with emissions for 1990, 2005, 2006 and 2020 using three emission scenarios prepared by IIASA/GAINS. Model evaluation was carried out for 2006. We calculated the changes between 1990 and 2005, and between 2005 and 2020. Changes in ozone, particulate matter and nitrogen deposition are the central theme of this study. A description of the formation of secondary organic aerosol requires the prediction of the partitioning equilibrium of organic compounds with multiple functional groups between gas and organic particle phase. While this is typically done by predicting both the saturation vapour pressure and the activity coefficient in the organic particle phase, we demonstrate here that it is feasible to predict the partitioning equilibrium directly. This direct approach has greater precision. This study presents in situ cloud microphysical observations obtained during a double flight in a Hector thunderstorm during the SCOUT-O3 campaign from Darwin, Northern Australia, in 2005. The measurements show a change of the micophysics with the storm's evolution. The clouds in the dissipating stage possess a high potential for affecting the humidity in the tropical tropopause layer. Long-term water vapour measurements from the MOZAIC programme are a unique source for upper troposphere humidity data. However, due to an error in the calibration procedure, RH data from MOZAIC were biased towards higher values for the period starting in year 2000. Here we report the procedures followed to reanalyse the calibrations and to reprocess the entire MOZAIC RH data. This study serves as the reference publication for the reanalysed MOZAIC RH data base for the period 1994 to 2009. A new carbon cycle data assimilation system (Tan-Tracker) is developed based on an advanced hybrid assimilation approach, as a part of the preparation for the launch of the Chinese carbon dioxide observation satellite (TanSat). Tan-Tracker adopts a joint data assimilation framework to simultaneously estimate CO2 concentrations and CFs and thus gradually reduce the uncertainty in the CO2 concentration evolution through continuously fitting model CO2 concentration simulations to the observations. Phytoplankton suspensions were treated with high and low ozone levels, and volatile iodine (I2)-containing compounds were measured. Iodocarbon emissions were independent of the ozone level. I2 emission showed a strong dependency on the ozone level in the air as well as on the iodide concentration in the sample suspension. The experiments show that microalgae suspensions are capable of emitting I2 by the reaction of ozone with dissolved iodide at the air-water interface under natural conditions.